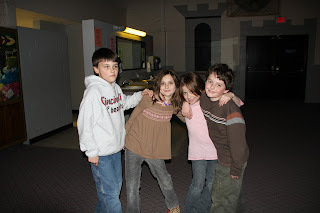 Once a month they have a skating party at Castle Skate in Loveland for Ryan's school. He has never wanted to go before but decided he wanted to do it this month. We picked up 2 of his friends and went. He has never skated before. 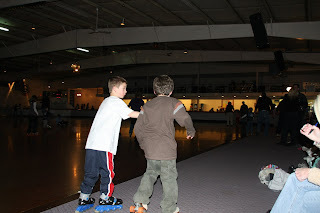 He got his skates on and I was tying his friends skates look up and he was gone. He clung to the wall for a bit and then the girls dragged him off. He fell a lot but did very well for never being on skates before. He was doing really well by the time we left. He had a lot of fun. Tons of his friends were there. 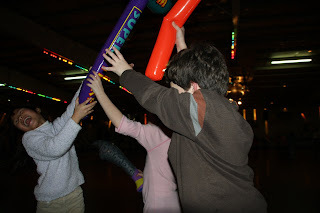 They also bought blowup hammers and had a little war. It was a good night for all!! Looks like we'll be going every month! Oh how cool! I would love to do that with the boys. Kim said that around here it is all teens and the little ones get trampled! Sammy would probably fall a lot too. 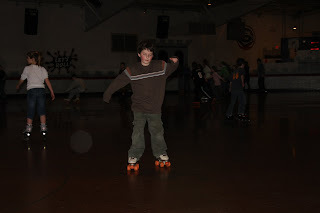 Oh I loved skating when I was little. Looks like he ahd a great time! aww, too cute! Dawson's school has the same thing at our local rink. I can never take him tho since I work and Shawn gets home too late. 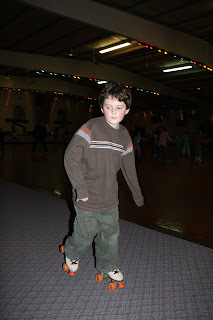 I used to skate a lot as a kid too. 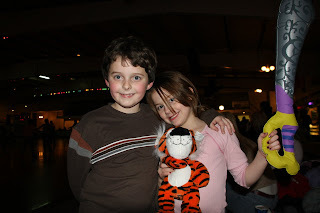 My best friend's parents owned the local skating rink and we'd go every so often. It'll be nice for Ryan to go and play with his friends and have fun every couple weeks!! Yeah, I was thinking that too.....The skating rink is ALWAYS a good place to pick up the ladies!! Looks like he had fun!